Puyallup is a large city in Pierce County, Washington, with nearly 40,000 residents. It is located in the western part of the state, just 10 miles southeast of Tacoma and about 30 miles south of Seattle. This is a suburban to urban community. 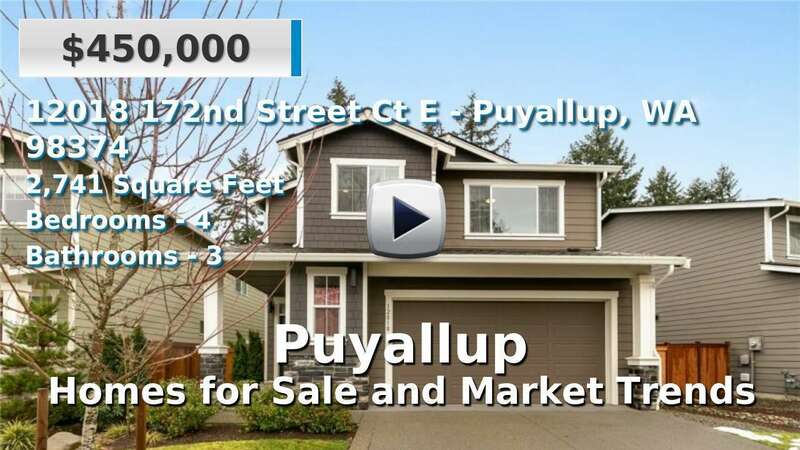 Homes and condominiums for sale in Puyallup are newer than most homes in the state, and new construction is a readily available option for home buyers here. Many people in Pierce County commute to work, especially in Seattle or at Joint Base Lewis-McChord. The median commute time is about 27 minutes. Neighboring cities include Tacoma, Lakewood, Spanaway, Sumner, Bonney Lake, and South Hill. The city of Puyallup is perhaps best known for the Puyallup Fair, Washington’s largest fair and one of the top ten largest in the country. With over 1 million visitors, the fair is a major draw for this area of western Washington. 2 Beds | 1.75 Baths | 1545 sq. Ft.
2 Beds | 2 Baths | 2176 sq. Ft.
4 Beds | 2.75 Baths | 2458 sq. Ft.
3 Beds | 2.25 Baths | 1438 sq. Ft.
3 Beds | 2.25 Baths | 1517 sq. Ft.
3 Beds | 2.25 Baths | 1543 sq. Ft.
3 Beds | 1.5 Baths | 1639 sq. Ft.